This month in our MD Quilt Gallery we have the pleasure of displaying a number of quilts using an unconventional fabric. 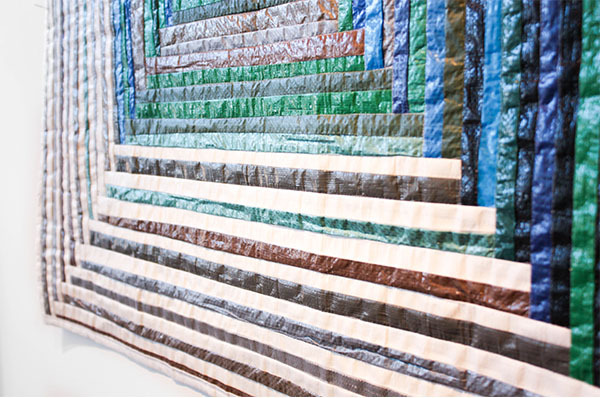 Wynde Dyer is a local artist who, among other forms of art, creates one-of-a-kind quilts using tarps. 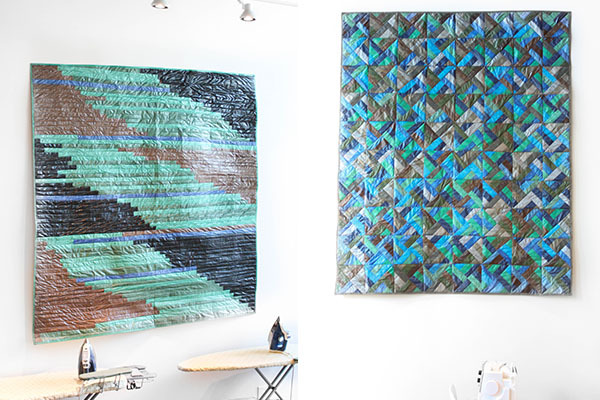 Wynde’s quilts have a water-like quality as they pick up and reflect the bright light in our studio. 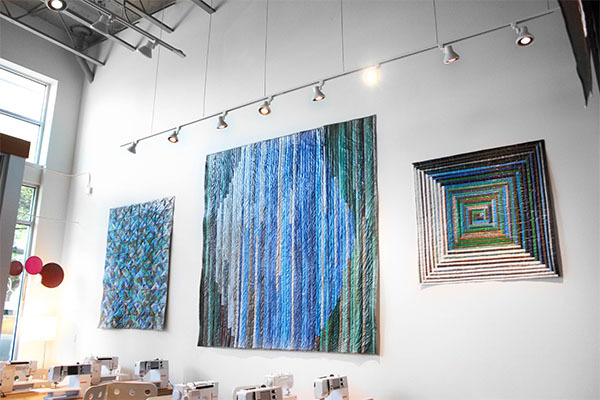 Join us on Sunday, August 9 from 4-6 PM to meet Wynde and check out her unique quilts in our gallery. “In the spring of 2012 I was displaced from my home of five years by a greedy landlord. My no-fault eviction came at a most inopportune time. I had just lost my corporate disability insurance, and shortly before that I liquidated my 401K and borrowed copious amounts of money from friends to finance a life-saving emergency surgery for my service dog. Without an income or the wellness to work, I had no choice but to give my housemates notice, to sell everything I owned in a fully-furnished 5-bedroom home, and move into a 1988 Volvo Wagon. These quilts are about the hikes my dog and I took throughout the Pacific Northwest during our 9-month stint with homelessness. The city was no longer safe. Every house was a trigger. Every person was a threat. Prior to this time, I found no solace in nature. Nature was a place where wild animals, serial killers, or contaminated water would get you for sure. But somehow, when faced with the maddening realization that I could no longer afford to subsist in the quickly gentrifying city I had called home since 2001, nature became the lesser evil. So we ventured out to the sea, into the Gorge, up the mountains, down into the valleys. We hiked all day, as many days a week as we could afford to fill up the tank. When we couldn’t buy enough gas to get to a trail-head, we’d swim and soak up the sun at our special place on the Sandy River. There were times I thought we might die from fatigue, heat stroke, hunger, dehydration, or sadness, but somehow we made it out alive. As I grew more attuned to my body, the psychological pain subsided, and, slowly, my terror was replaced with tranquility. We will be hosting Wynde’s quilts through the month of August. Visit Wynde’s website for more information about her work. 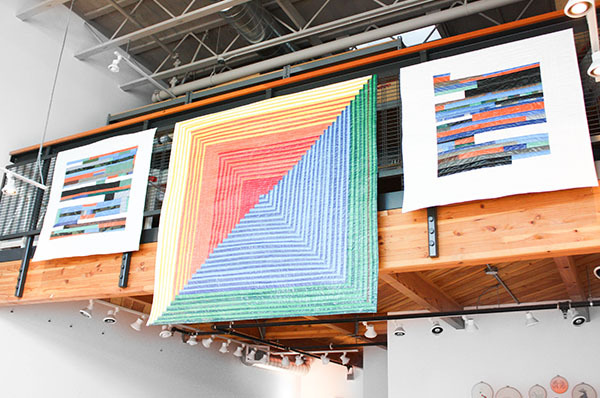 Wynde Dyer (1980) is a process-based artist who lives and works in Portland, OR. While her work utilizes diverse materials and methods, it is united by a concern for representing and transforming psychological space. Best known for building a ½-sized model of her childhood home inside a gallery and for casting a 1000-pound bathtub out of soap, Dyer has shown widely around Portland, and was the owner and creative director of Golden Rule Gallery from 2010-2012. She was the recipient of a 2013 Artistic Focus Project Grant by the Regional Arts and Culture Council (RACC) and a Professional Development grant by the Oregon Arts and Culture Council (OACC). She and her Great Dane, Daisy, are no longer homeless. This show looks to be one of the best That I have seen of Wynde’s. Each piece is informative, and speaks to the inner soul. Love Wynde’s work, and have been very sad to miss this exhibit.